When Spring Festival is near, the city shows some interesting details to me. 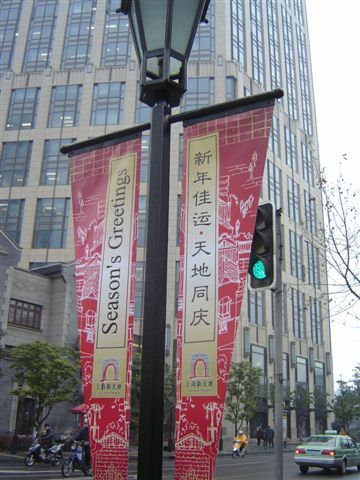 The Huang Pi South Road near Xintiandi section was decorated to celebrate the Spring Festival. The Xintiandi group made the celebration banners. It costs some money but it is nothing for so successful real estate company. The twin towers of the Grand Gateway are approaching the end of construction. 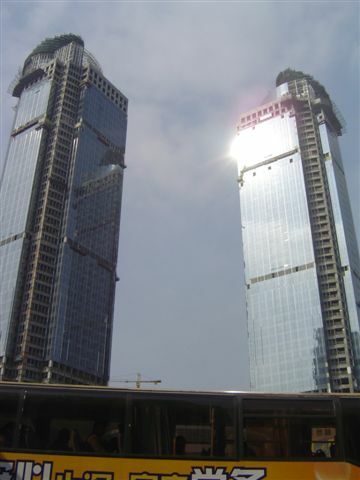 Glasses were installed to this new tallest building in Xujiahui. It seems the construction will continue during the holiday and the workers won’t have their holiday this year, as the previous years. The picture below is the farmer workers statue group at the corner of the Shanghai Art Museum. 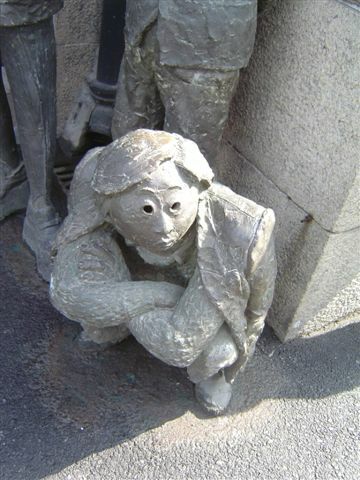 The statue group vividly reveal the expression of the specific group of people in this city. Now, as Spring Festival is near, the majority of them are leaving Shanghai back to their hometown. Construction site starts to lack of workers. Ayi’s price is rising and more often, people cannot find an Ayi (people who comes to your house to do the cleaning work, babysitting, or cooking) recently. Labor-intensive positions like pure water delivery, garbage collection, that were filled by farmer workers are lack of hands. With their leaving, it shows the same appearance as a severe strike. Spring Festival can also be called the Farmer Worker’s Days – it is the time for everyone who enjoys the benefit of their hard work to think of them by suffering their short absence. Shanghai continue to pull down old houses near the Xintiandi area to build new residence or entertainment areas there. 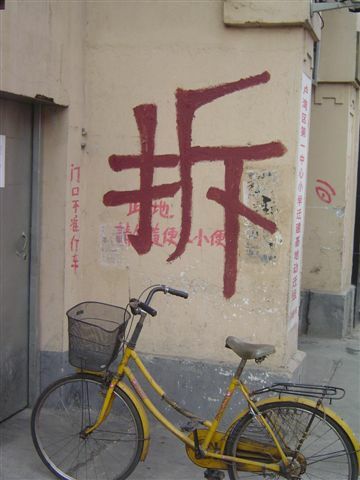 More and more walls were painted with large red character: 拆 or Destroy in English. At the Nanjing West Road at the People’s Square, around 9:00 PM, when banks closed its door, farmers from nearby area came to the street to sell their fresh fruit, in the heart of this large metropolitan. She still needs to collect enough money to prepare for the Spring Festival. People passed in a hurry and not many were in the mood to buy fruits at street. I’m wonrdering the purpose for showing those farmer workers statues. Actually I don’t know. imanull, I didn’t mean the shops, bars and restaurants in Xintiandi are making money – they are not the one to put on those decoration. I agree with you not all business there makes money, but one thing is for sure, the real estate developer, Shui On is a big winner. 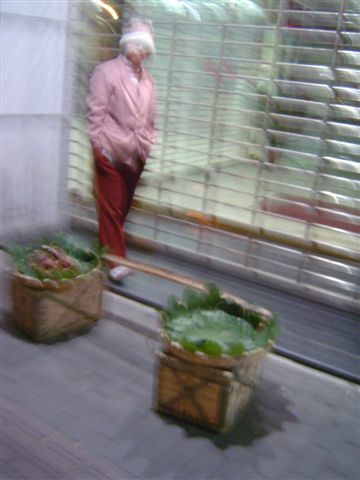 They are expanding dramatically in the last few years and now, they are buying more and more lands near Xintiandi. 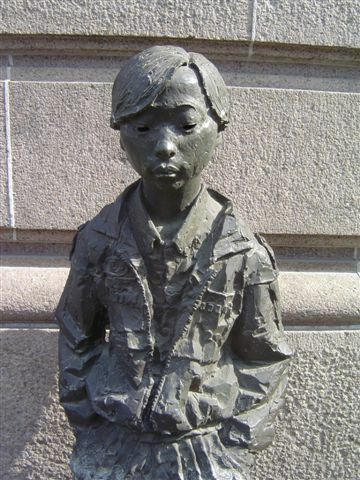 Lu Heli, it was the picture of the statues before the Art Museum that reminded me to talk about the farmer workers. My point is, they deserve the respect from those who are obligebed to be a city citizen. Spring Festival should be the time to thank them for their contribution since their leaving have caused many people to think about them. I am a believer of equality, in the country of China, there should not be a two tiers of citizen, the farmer and the city dweller which cause discrimination and paradox among people. Its interesting to see Shanghai’s “Chai” as compared to Beijings…The character can be found around Beijing, I didn’t realize that now it is also common to see it in Shanghai. It is true that the contribution to the major cities of China could not be made without those workers, but its mostly a fact that gets passed over by most people. The second statute especially that seems to have no eyes is very spooky…Its interesting to see the English translation used is “Season’s Greetings” which is typically used around the Christmas/Hannukah holiday. Today I talked to a collegue, just coming to Shanghai for a few months of time. He asked me “what is the true idea of communism in China if it’s not to work for the people ?” Someone can tell him about this ? Just for information, in most countries the order of governing is : communism (only minded for the peoples conditions), social democrats, middle class, right wing, extremists (like nazis and so). First in order should be the best choice for the poor and those in need of help, the last is the choice of the most egocentric and selfish people. And why am I being abused in the Shanghai traffic every day by rich peoples BMW’s and Lexus’es, driving right through the pedestrian walks with “simply ordinary” people (who cannot afford a car for protection) ? Someone can tell me about this ? And why is it, that it is not possible to make a reservation for a train ticket in well advance before the spring festival holiday ????? If you have money, you book a seat in a plane, and then you can go on time. The system seems tailor made for the well-off to get the benefits. Where are the “people’s” representatives, someone can tell me about this ? Carasten, you got the point. I agree with you. You were seeking for answers. So do it. It is not fair for the farmer workers. They are among the poorest class in this city without protection. Now, on the media, people congrates to them for getting the salary – it is the first year in money years they can get their salary on time before the Spring Festival. Sad enough? When I saw the pictures on Shanghai from any sources, I got the same impression that is not so positive, a little bit strange. This world is so different. There are certain classes in China today that are almost universally forgotten about, the plight of workers is at least occassionally picked up as something that needs to be improved upon and gets coverage in foreign media a lot. However an issue that is very dear to me that never gets very little coverage is the problems for the disabled in China. They are given very little opportunity and the organization and structure that is supposed to be protecting them (the city or provincial, national organizations for the disabled with Deng Pufeng at the head) is only holding them back, not attempting to push for real changes, it is very sad.